Add a fun and fresh border or corner design to your summer table linens with this collection of free embroidery patterns. 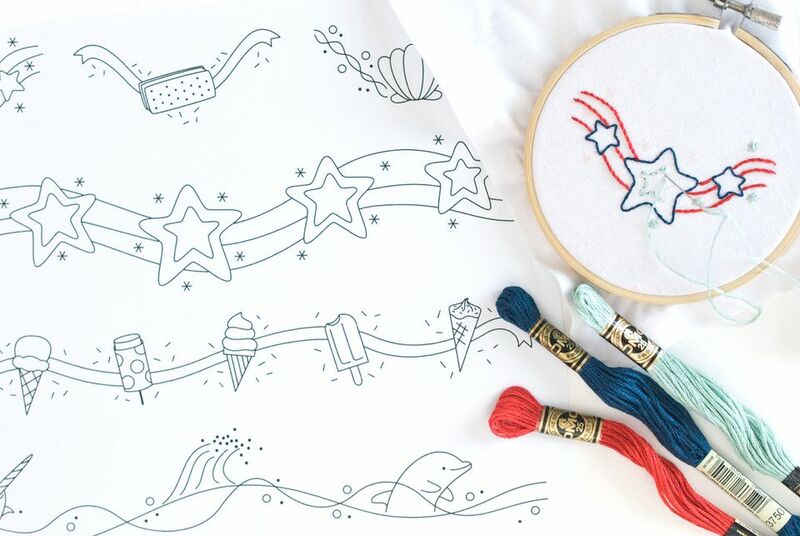 With patriotic stars, sweet summer treats and a few sea creatures, these designs will make a splash along the edges of so many seasonal projects. Each pattern style has coordinating border and corner designs so you can use them alongside each other or as separate elements. Just picture a set of dessert napkins featuring ice cream sandwiches in the corners! Or perhaps a kitchen towel with a row of stars and stripes along the bottom edge. And you don't have to limit these patterns to table linens. Consider stitching the ocean border above the hem of a t-shirt or working the ice cream border along the edge of a pillowcase. There are so many places and ways to put these summery borders and corners to use! The entire page of borders and corners is in a single downloadable JPG that will fit on a standard piece of paper. Choose "fit to page" or a similar setting. If you want to make the patterns larger, it's best to take the file or printed page to a copy shop and have them scaled to fit on oversized paper. An alternative is to scale the pattern in sections and fit them together like a puzzle. To transfer your pattern onto fabric, use a fine tip iron transfer pen or your favorite method for marking a pattern. The stars and sea patterns will fit together seamlessly, end to end, so you can make the border as long as you need. For the ice cream border, repeat it by placing the pattern with a small gap between the ribbons. Note: These patterns are copyrighted to Mollie Johanson and may be used for personal and cottage industry projects. Each of these patterns has a slightly different color palette, but the colors shown above are only suggestions. The stars and stripes look great in red and shades of blue or white. Changing the colors to tropical shades will make the design less American Independence Day and more summer fun. Likewise, the ice cream and ocean waves will both look great in fantasy pastels or in bold brights. Use any combination of stitches that you like or are comfortable with. Here are a few suggestions for basic stitches that work well throughout the patterns. Stem stitch: Use this stitch for the stripes, ribbons and waves that run behind the motifs in the foreground. Back stitch: This stitch works well for the stars, ice cream treats and the sea creatures and shell, as well as the small bubbles. French knot: Use French knots for the dots on the ice cream sandwich, the tiny bubbles and the eyes on the narwhal and dolphin. Straight stitch: This is a perfect stitch for working the sprinkles around the ice cream treats. Star stitch: Form the small twinkle stars with a variation of this stitch, matching the lines of the star to the pattern. Depending on the size at which you stitch the patterns, you may want to adjust the number of strands you use. However, using three strands throughout works well.